This Feiss Drawing Room flush mount 3 light ceiling light in walnut with scavo glass shade is traditional and features Edwardian period style. A wonderful ceiling fitting, with a deep mount featuring filigree metalwork, domed ribbed pale amber scavo glass dish and detailed lower finial. A particular feature of this light is the diamond fish-tail design around the broad rimmed mount. Even from a distance this ceiling light will attract immediate attention with its dominating structure. Perfect for any traditional, classic or period room with a low ceiling. Part of a casual iron collection, featuring overlapping arches and fluted detailing in the pressed glass shades and the die-cast aluminium fitters. The fretwork elements draw on traditional British architectural themes. There are matching fittings available in the Drawing Room collection that includes a large variety of wall lights, flush and semi-flush lights and chandeliers; please see below for the complete range which includes a matching decorative mirror. This stunning light is supplied by Elstead Lighting and designed in the USA by Feiss, founded in New York in 1955. 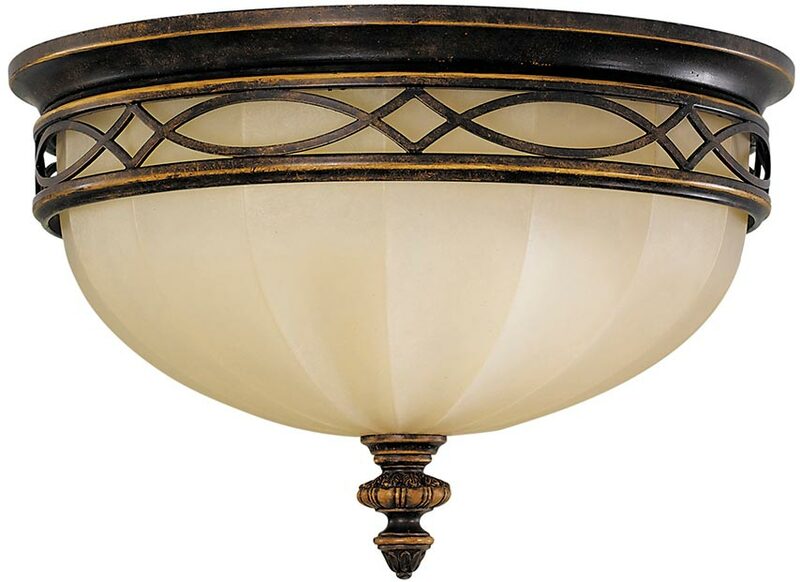 They have become well known over the years for their contemporary yet classic styling, quality and great original designs like the Drawing Room flush mount 3 light ceiling light in walnut with scavo glass shade you see here.